The kids I babysit are obsessed with birthdays. When they play play dough they love to stick things upright in a lump of the play dough as candles and then sing 'Happy Birthday' (usually at the top of their lungs) before blowing their candles out. The four year old, Fiona, also likes to get regular updates on how old the others are. Last week, when she asked how old the youngest is, I told her he's one and she asked, "Why?" "Because he has had one birthday," I told her. 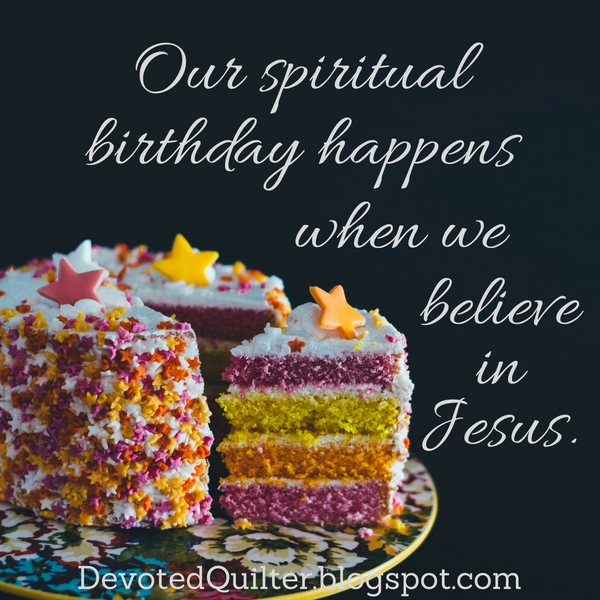 A Pharisee who came to visit Jesus one night was shocked when Jesus told him that he needed another birthday if he wanted to enter the Kingdom of God. 'What do you mean?' exclaimed Nicodemus. 'How can an old man go back into his mother’s womb and be born again?'" (John 3:3, 4). Before we go any farther, can we just pause to acknowledge that the snarky, sarcastic response was already alive and well in Jesus' day? Of course, you could read Nicodemus' question as a perfectly straight question, if you want to, but there's so much more personality in it if you allow him to be sarcastic. With that one change in tone Nicodemus just springs to life. Obviously, Jesus didn't mean for us to go back into our mothers' wombs and be born again, so what did He mean? Jesus gave Nicodemus a rather long answer that boils down to, "the Holy Spirit gives birth to spiritual life" (v. 6), which maybe doesn't help a whole lot. Even Nicodemus didn't understand and had to ask in verse 9, "How are these things possible?" "For this is how God loved the world: He gave his one and only Son, so that everyone who believes in him will not perish but have eternal life. God sent his Son into the world not to judge the world, but to save the world through him" (v. 16). We are born again, through the Holy Spirit, when we believe in Jesus as God's Son, sent to save everyone who believes in Him. That's it. There's no special ceremony, no specific words we need to use, nothing, in fact, for us to do besides believe. Jesus has done everything else that needed to be done. In so doing, "he has rescued us from the kingdom of darkness and transferred us into the Kingdom of his dear Son, who purchased our freedom and forgave our sins" (Colossians 1:13). And that is our second birthday.